Ever since the invention of the first motorcar in 1886, mankind had been obsessed with speed. Throughout the early 20th century, car manufacturers were popping up all over the world, and technological advancements were made at an unrelenting pace. Through this constant process of experimentation, the basic layout of the car as we know it today was slowly being realized. Just as the car was gaining traction on a truly global scale with the advent of the impossibly popular Ford Model T in 1908, the world slipped into one of the most deadly conflicts in human history. The outbreak of the First World War tore apart entire countries and claimed a tremendous amount of human casualties, but it also had a tiny positive side. The war introduced the concept of fighter aircraft, fast reconnaissance vehicles and armored tanks. The opposing powers entered an unprecedented technological arms race to produce faster and more agile vehicles, which lead to great leaps in vehicle design. The Sopwith Camel, one of the world's first fighter planes. As these events were unfolding, one Malcolm Campbell was at the forefront of another great engineering testbed: motor racing. Campbell was the son of a diamond dealer, but he found a much greater interest in the newly developing sport. He started racing motorbikes in 1906 at the age of 21, and switched to cars in 1910. While competing at Brooklands, he decided to christen his car Blue Bird after seeing the Maurice Maeterlinck-play The Blue Bird. After competing at Brooklands for four years, Malcolm Campbell was drafted into service as a motorcycle dispatch rider on the horrific battlefields of France. His role changed drastically when he was transferred to the Royal Flying Corps as a ferry pilot. Campbell was deemed unfit for service as a fighter pilot as his superiors saw him as being too clumsy. Despite this apparent clumsiness he had risen to the rank of Captain by the end of the war. Nevertheless he decided against pursuing a military career for the moment, and went right back to his biggest passion. Campbell formed a partnership with British manufacturer Sunbeam Motor Car Company. Driving for Sunbeam, he managed to set a pair of world land speed records. Propelled by the 18.3L V12 aircraft engine in his Sunbeam 350 HP Blue Bird, he clocked a speed of 146.16 miles per hour (235.22 kilometers per hour) at Pendine Sands on September 25, 1924. The following year Campbell made a second attempt, and he became the first person to travel faster than 150 miles per hour on land. A speed of 150.87 mph (242.8 kph) was enough to make him a national hero. Malcolm Campbell and the Sunbeam 350 HP, Pendine Sands 1924. With the 150 mph barrier broken for good, Malcolm Campbell set his sights of the next milestone, 200 mile per hour. To do this he decided to split from Sunbeam and build his own car. 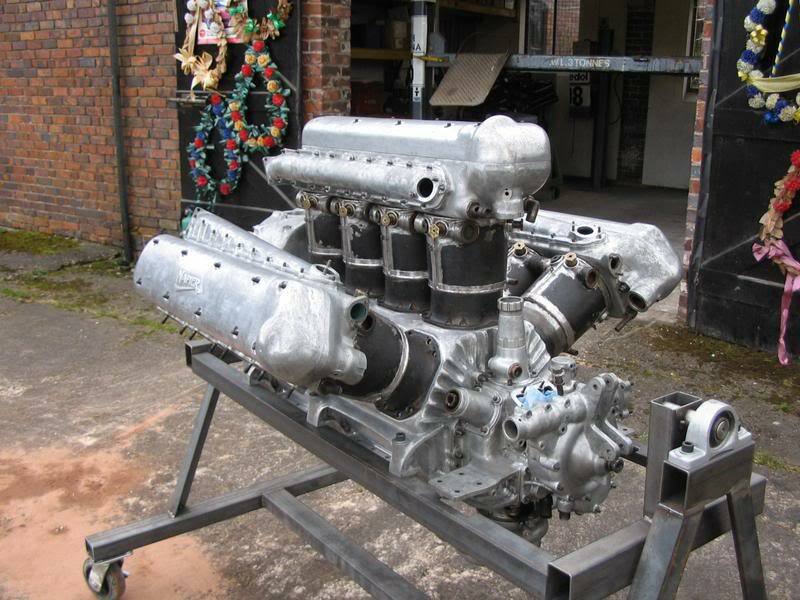 He recruited luminary designer Charles Amherst Villiers to construct the Blue Bird II around the unusual Napier Lion V 22.3L W12 aircraft engine. The weirdly laid out engine was a child of the First World War, dating back to 1917. By the late 1920’s it was the main engine used by the Royal Air Force. Regardless of its age, the manic engine presented the only real way to achieve the monstrous power figures needed to attain record breaking speeds, as most car companies had no way to produce anything remotely similar. In Blue Bird II, the engine was good enough for 500 horsepower. Giant aircraft engines like the Napier Lion were the only way to go immediately after WWI. With Blue Bird II, Malcolm Campbell entered into a ferocious fight with fellow land speed record ace Major Henry Segrave, who had taken his place at Sunbeam. The two swapped records several times, causing Campbell to rebuild his car to include improved aerodynamics and a 900 horsepower racing version of the Lion engine tuned for the Schneider Trophy seaplane race. His efforts proved to be in vain however. Segrave had taken a page out of Campbell’s book, and decided to leave Sunbeam to construct a more competitive car. In 1929, this approach netted him a drive with the radically streamlined Golden Arrow, and he pushed to a dizzying 231.44 miles per hour (372.47 km/h) on Daytona Beach. Malcolm Campbell knew his Bluebird III had no hopes of keeping up, so he decided to develop an entirely new design to beat Segrave’s incredible record. The Campbell-Napier-Railton chassis, showing the W12 engine and staggered gearbox. Visionary designer Reid Railton was given the arduous task of drawing Malcolm Campbell’s next speed machine. The biggest change over the previous Blue Birdwas the engine. To beat the Golden Arrow and it’s 925 horsepower Napier Lion VIIDSchneider Trophy engine, the new car would harness the dark art of supercharging. This made the haphazardly named Campbell-Napier-Railton Blue Bird the first land speed record car to combine a large displacement aero engine with forced induction, and lead to an astonishing power figure. With the help of a massive centrifugal supercharger, the 23.9L W12 engine now produced up to 1450 horsepower at a lazy 3600 rpm. But Railton didn’t think of power alone in his quest for speed. Blue Bird being wheeled out of the Napier factory, 1931. In an effort to replicate Golden Arrow‘s success, he instructed Gurney Nutting and Co. Ltd to fashion a beautifully streamlined body out of the thinnest aluminium possible. The shape included a giant stabilizing fin similar to Segrave’s car, an aerodynamic coverings for the massive 37 inch front and 38 inch rear Dunlop steel wheels. To eliminate the drag caused by a traditional large radiator, Golden Arrow had used dry ice stored in large sidepods to cool its engine. For Blue Bird, Railton thought of a different solution. He placed a conventional radiator on the car’s nose, but isolated it from the engine compartment. Instead of occupying the engine bay, the unit sat in a specially designed cowling. Normally the radiator would create massive amounts of drag as the air swirled around in the large open area of the engine bay, but he smaller flow-through cowling very handily eliminated this disadvantage. The front cowling helped increase Blue Bird's potential. Reid Railton tried everything in his power to keep the car’s profile as low as possible, which moved him to engineer a 7 inch (17.8 cm) offset in its KLG 3-speed constant mesh transmission. This enabled the humongous drive shaft to bypass the driver on the left, leaving room for a much lower driving position, which in turn lowered the bodywork. The gigantic chassis was suspended on Woodhead leaf springs, which measured 94 cm (3 ft 1 in) on the front and 125 cm (4 ft 1.5 in) on the rear. Braking was handled by a single Alford and Alder 18 inch (457 mm) steel disc brake mounted on the rear axle, which was assisted through a Clayton-Dewandre vacuum servo. In all, the 7.6m long high speed behemoth weighed a competitive 3606 kg (7949 lbs). Captain Malcolm Campbell demonstrating Blue Bird, Brooklands 1931. With the car finally finished three years after Henry Segrave beat him to the record, Malcolm Campbell focused on finding a new venue to make his next attempt. He had already traveled to the desolate expanses of the Verneukpan dry lake in 1929, but by then the superiority of Golden Arrow had already established itself. As Campbell was traveling the African wilderness, his arch-nemesis’ luck ran out. Segrave had looked for another challenge after receiving knighthood for his world land speed record, and had since taken to the water speed record. Shortly after setting a 98.76 mph (158.94 kph) record in his hydroplane Miss England II, he was killed after the boat suddenly capsized at high speed on Lake Windermere on 13 June 1930. Malcolm Campbell was determined to keep the land speed record proper and British. Left without his biggest rival, Campbell set his sights on Segrave’s favorite stomping ground, Daytona Beach in Florida, USA. The onslaught of new American challengers motivated him to keep the record in proper, British hands. Henry Segrave might have been his nemesis, but at least he wasn’t a bloody Yank. Campbell-Napier-Railton Blue Bird at Daytona Beach, 1931. Malcolm Campbell arrived at Daytona Beach in February of 1931, and wasted no time looking at the snazzy ladyfolk. He immediately started speed trials, and came closer and closer to the tantalizing 250 mph mark. On the 5th of February 1931, he clocked a fastest average of 246.09 miles per hour (396 km/h), smashing Segrave’s record by a substantial 15 miles an hour (24 kph). His amazing achievement secured British possession of the world land speed record for the moment, which once again made him a widely celebrated national hero. Upon his return he attended a banquet in his honor at Mansion House, the residence of the Lord Mayor of London. Furthermore, he was knighted by King George V at Buckinghame Palace on the 21st of February 1931. The land speed record officials posing with Blue Bird, Daytona Beach 1931. Not content on stopping just shy of the 250 mph mark, Campbell returned to Daytona Beach in 1932. Blue Bird had only been slightly modified with a new nosecone. After another series of speed trials, Sir Malcolm Campbell again made history as the first man to travel faster than 250 mph or 400 kph on land. His record run on 24th of February 1932 saw him reach a mind-boggling 253.97 mph (408.73 kph). Sir Campbell was delighted to have added another record to his tally, but still hadn’t achieved his ultimate goal: to break 300 miles per hour. He realized the Napier Lion engine was operating at its absolute limit, so he elected to switch to the elusive and savagely powerful Rolls-Royce R V12 for 1933. The Campbell-Napier-Railton Blue Bird was a spectacular machine in every way. Built to settle a rivalry at the highest level, the supercharged colossus reached an unprecedented amount of power. More importantly, the gargantuan grunt was backed up by incredibly clever engineering. Through perfect packaging and advanced aerodynamics, designer Reid Railton was able to craft the ultimate speed machine. Sadly Sir Malcolm Campbell and Blue Bird were never given the chance to beat their biggest rivals in earnest, as Sir Henry Segrave died before the car had been completed. Nevertheless the slick design helped Campbell to keep the record in British hands, and be the first to pass the 250 mph / 400 kph barrier. With their amazing performance, Sir Malcolm Campbell and his Blue Bird became enduring legends.